Cashgopher - Make Money for doing nothing! you earn money by just leaving your computer on. the site is owned by the same owner of the reputable myLot which known to be a legit site and paying up until now. - Then... Refer Others & Make Even More Money!!! Janmashtami, the birthday of Lord Krishna is celebrated with great fun and fervor throughout the country. This day not simply signifies the birth of the reincarnation of Lord Vishnu but also the birth of a divine teacher who invoked the entire mankind with the divine knowledge and power. Thus, Janmashtami apart from its ritualistic celebrations also holds an eternal meaning to it. This festival is celebrated in various parts of the country though the customs and rituals vary from place to place. However, there are certain universal customs that are followed throughout the length and breadth of country. 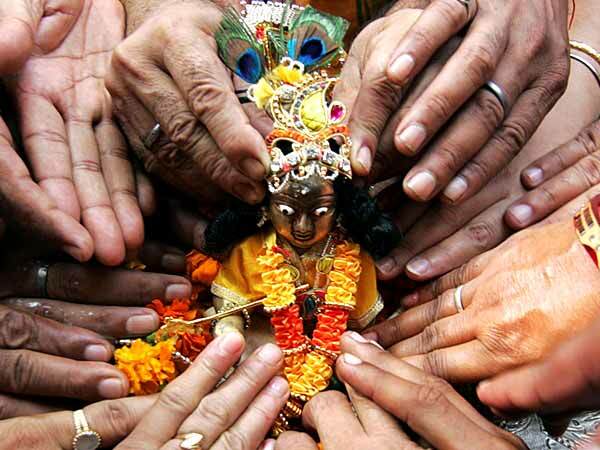 Here we have discussed in detail the rituals and customs of Janmashtami. The most common and essential ritual followed on the day of Janmashtami is the fasting by devotees. Most of Lord Krsihna’s devotees fast for on this day and open the fast at midnight when it is assumed that Lord Krishna has been born. At the time of midnight also, the people who have observed fast whole day prefer to have only milk and milk products as they are considered auspicious as well pure. Some of the ardent devotees of Krishna observe the fat for the entire day even without consuming water- it is called ‘Nirjal Vrat’. There are other devotees who observe two day fast in the honor of Lord Krishna. It is said that chanting Lord Krishna’s name with entire devotion brings immense joy and pleasure in the life of the devotee. So, on the birthday of Lord Krishna, devotees indulge in continuous chanting of Krishna’s name for the entire day. They chant sholkas, mantras, richas from the Veda. They also read Bhagwat Geeta and sing bhajans in the name of Krishna. It is said that chanting 108 names of Lord Krishna brings auspiciousness in one’s life. Bhajans are a vital custom of the Janmashtami celebrations. Devotees sing and dance with fervor in the name of Lord Krishna. In many temples of Mathura and Vridavana, you will find devotees mesmerized and overwhelmed with their love and devotion for Shri Krishna. In the midnight celebration, people gather at a place and sing several kinds of bhajans to highlight his feats and his divine characteristics. Very much like the Ramleela, devotees of Lord Krishna organize plays on the life of Lord Krishna called Krishnaleela. In these plays organized by professional as well as amateur artists, several important deeds and legends associated with Lord Krishna are staged. It is known to everybody that Lord Krishna was extremely fond of sweets and dairy products. So on the day of Krishnashtami, devotees of Lord Krishna prepare umpteen varieties of sweets and dairy products and offer them to the idols of Krishna. This ritual is called ‘bhog’. Later, these sweets are distributed amongst the devotees as ‘ Prasada’. At many places in the country, devotees tie swings on the trees and take rides on that. It is said that taking a swing ride on the occasion of Janmashtami is considered auspicious. This ritual is extremely popular in the rural parts of the country.